In order to strengthen the bonds with our sisters in Haiti, we started pairing women here with women in Latiboliere as prayer partners. We were not sure how this would work but we were certain there would be a spiritual connection. The original group of 11 partners has now expanded to 47. Prayer partners share pictures of each other, and through letters share stories about their families and their interests. The power of prayer can not be measured. However, the bond between St. Mary Parish and Our Lady of Perpetuel Help in Latiboliere has been strengthened. 94 women pray for each other every day. Reflections on scriptures are shared between the groups as well. Women from this group traveled to Latiboliere in December of 2008 for the sole purpose of prayer, reflection and establishing a rapport with their prayer partners. In April 2009, 23 prayer partners gathered at St. Mary for a morning of reflection and prayer. 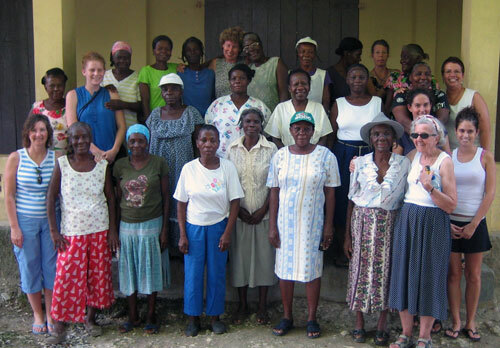 At the same time, the women's group in Haiti gathered for prayer. Standing together in prayer and solidarity was a very moving experience. Communication does not occur as often as we would like. Due to the language difference, letters need to be translated. But we are fortunate to have people with those skills within our parish. 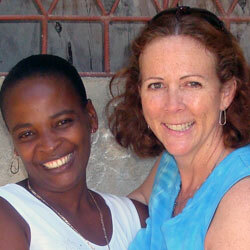 Mailing letters is not an option, we are dependent on teams traveling to Haiti to hand deliver our communications. Please contact the Liaison to Prayer Partner Initiative for additional information. While all available partners are matched at this time, the power of your prayers remains important. Please continue to pray for our sister parish. Watch the bulletin for future prayer partner opportunities.